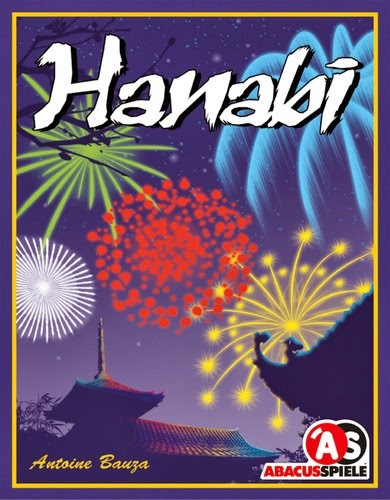 Designed for two to five players, aged eight and up, Hanabi consists of five sets of coloured cards—red, blue, green, white, and white, plus three red tokens and eight blue tokens. Each set consists of ten cards, each containing three cards numbered one, two numbered two, two numbered two, two numbered two, and a single card numbered five. The red tokens are failure tokens, indicating a poorly displayed firework; the blue tokens are clue tokens, used to impart information to another player about the cards in his hands.